The weather in East Yorkshire has suddenly turned – from clear skies with a smattering of sunshine to still warm us up, to a murky grey sky and cold winds blowing menacingly off the North Sea. But are we upset? Not really. It’s time to make steaming bowls of comforting soup to keep us cheerful and warm . And for some reason we had a surfeit of celery lurking in our fridge, so here comes our Celery Soup Recipe. 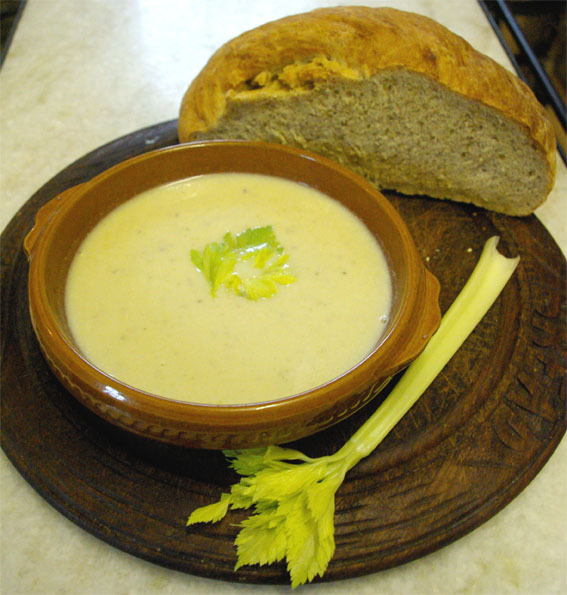 This is a very comforting Celery Soup Recipe, and we served it with Erik's fabulous loaf of Spelt bread, in big chunks. Very warming on a cold day, and very filling. I made enough to freeze a portion for the two of us for another day. Using a large pan, melt the butter slowly, taking care it doesn't burn. Add the chopped celery, potatoes, leek and onion. Stir to make sure all the vegetables are coated with butter, then put the lid on and simmer gently for about 15 minutes. Stir every so often, and make sure the vegetables don't fry. You want to sweat them, and let any liquid come out gently. Add the stock and the milk to the pan, then add the Bay leaves, the bouquet garni, the celery seeds and a pinch of salt. Cover the pan, and let it come to a simmer again, then keep on a low heat for about 25 mins, until the potato chunks have dissolved and the celery is very tender. Turn the heat off. Let the soup cool for 10 minutes, then carefully liquidise, pouring each batch into a big bowl. When all is liquidised, pour back into the pan and add the cream and the grated nutmeg. Bring gently up to boiling point, taste for seasoning and if necessary add a bit more salt and the black pepper. Ladle the soup into the bowls, add a dollop of thick cream, and a scattering of the celery leaves and a sprinkling of celery seeds. Enjoy. When we had our old Kitchen Garden in Hessle, I had a go at growing Celery in our raised beds. It was quite an interesting experiment, as I grew some red Celery. 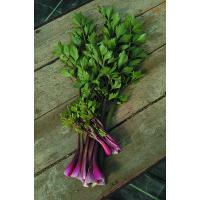 The taste was amazing when picked and eaten soon after harvesting. I would like to grow some in our new Kitchen Garden, and found this particular stunning Celery Red Giant in the catalogue from Kings Seeds. With a bit of luck this may be gracing our raised beds next summer. But I’m not sure what colour the Celery Soup Recipe will be in our soup bowls! It will be another interesting experiment, I think.